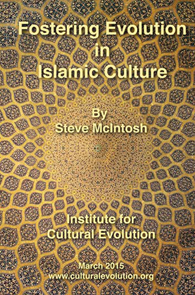 Soon after I seriously considered starting this blog, a fantastic white paper regarding the evolution of Islamic culture landed in my inbox, written by Steve McIntosh. Steve is the President and Director of the Institute for Cultural Evolution (ICE). I have had the opportunity to meet Steve personally through my engagement with evolutionary spirituality, and am very pleased and grateful to see his thinking being applied to this area of cultural evolution. On a personal note, Steve’s paper speaks directly to my own interest to find a deeper integration between the two powerful spiritual paths that have influenced my life—evolutionary enlightenment and Islam. Going from traditional Islam, which was still at odds with modernity, I was looking for something that didn’t negate the direct relationship to God, but that also spoke more directly to my postmodern cultural values. I found this in evolutionary enlightenment, and Steve’s paper speaks to this aspiration. On reading (and re-reading) his paper, I feel he articulates and touches on so many important threads—the historical trajectory, the current crisis with Islam, and the potential for both Muslims and non-Muslims alike to create a more stable platform for Islam to evolve. Importantly, Steve articulates the need for contemporary interpretations of Islam to make it more compatible with the positive values of modernity. I think he correctly points out that it is the center of gravity of the Muslim community at large in relationship to Western expressions of modernity, and not just the views of some isolated fundamentalists that are allowing the extreme acts of violence that we see on the news today. I’m further inspired by this paper to help contemporary Islamic thought to go forward. Since posting this review, Steve McIntosh was interviewed by Jeff Salzman on The Daily Evolver. Sample the following excerpt here (7min), and listen to the full interview below. Listen to the full interview here (34min).